After a riveting week in Lincoln, Nebraska, the Hens on Ice tour plopped us birds into Des Moines, Iowa. Not having much prior knowledge about Des Moines, I learned a lot in our time there. It's the capital of Iowa (with a surprisingly posh capital building!) and really the only city I can name in Iowa. They also don't sell wine in Walgreens and it's really cold in November, just to name a few things. Like Lincoln, I was happy to find some more local gems, including another sassy coffee shop and some weird, but great bars. There was even an Asian pizza restaurant, which looked wonderfully weird, but I never felt weird enough or wonderful enough to try it. And a shocking beauty within all this surprise sass is that it's all connected by an extensive skywalk system. After a day of freezing like a fool and crying on the empty sidewalks of Des Moines, I decided to try to join the smart birds up above, wearing t-shirts while it was snowing. I was reluctant after my hen friend Jen told me the horror story of her getting lost and stuck in the skywalks last year, and having to call the tour manager to rescue her. Dramatic and scary! But with so many people walking through the second level of Des Moines all smug and warm, I had to try it. My first walk took me an extra 20 minutes to get from A to B, but at least I was warm. With each walk, I learned more about the skywalk system and myself, and eventually figured out how to get from A to B in a somewhat sensible way. Des Moines: Who knew? 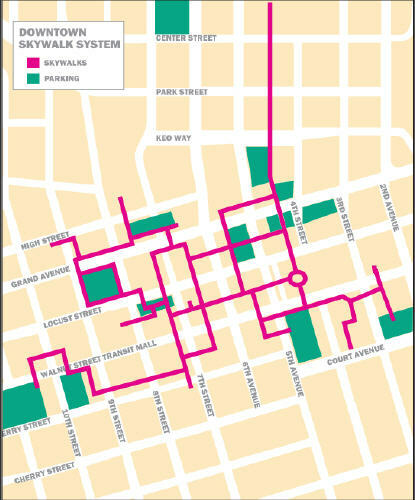 Anyone living in Des Moines probably knew, but for the rest of us, to see such an extensive skywalk system through the entire Iowa capital was impressive. 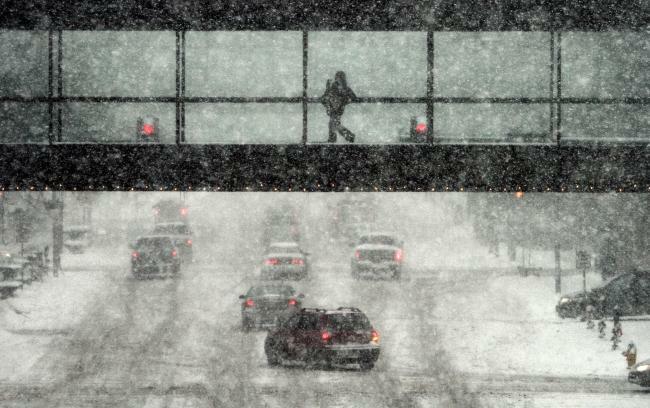 I know Minneapolis has a skywalk system, being a large, progressive metropolis with extremely miserable weather. I wasn't ready for Des Moines to be as progressive or miserable, but it is right on par. Good work, Des Moines! Take note, every city in Scandinavia. The maps: Where am I? Thankfully for people like Jen and me, the skywalk system has a map about every block to see your location in the maze. Sure, it didn't help Jen at all and only helped me marginally, but they are there. They are seemingly helpful, until the second map I saw was totally different from the first. Had I walked through some awful time warp and landed in Milwaukee? Was I getting glaucoma or vertigo? After a few minutes of questioning my location and health, I noticed that each map was a rotated version of the previous, with north being a different direction each time. I don't know why. Didn't we establish "north" to get some sense of direction and standard? The compass is a free-for-all in the Des Moines Skywalk system. At least there are also signs in addition to the rotating labyrinths on the walls. The frustration. I wasn't the only one getting lost, following signs to dead ends, and complaining out loud to no one. Once I got the hang of my route to work, I passed multiple families in despair. The scenes were out of an apocalyptic film: crying children, orphaned children, mom yelling, "No! That's not where we are! Where is the car? Where is Timmy?!" Dad yelling, "I told you this was a bad idea! Don't talk to me like that or I'm getting the divorce papers! Who the hell is Timmy?" I don't think anyone will ever know how many people enter the skywalk and never leave. Jen was a lucky one. Where the hell is the car? The confusion. I've never lived in a skywalk city, or even visited one, so when it's frigid outside, I know I need to bundle up to face the elements at some point in the day. But in Des Moines, it's possible to traverse the entire downtown and never be outdoors. I walked from my hotel room to the arena without stepping outside. If it's snowing outside, I could wear a t-shirt all day while being fully functional in downtown Des Moines. It just doesn't make sense. Now I'm spoiled. Where's the skywalk system in Rock Island, Illinois? I'm pissed and cold. Keep reading! "Land of Something." "The Hen's Guide to Sweden!"